Wow! What a spectacular beauty! 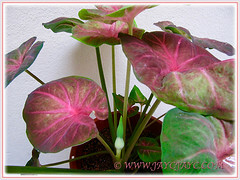 It was love at first sight when we saw several pots of this stunningly coloured caladium. They were observed at a garden nursery in the neighbourhood in August, 2014. Of course, we happily bought home a pot of them without hesitation. And, delighted to note that they are happy, healthy and blooming intermittently all year round. Without doubt, this gorgeous variegated beauty, the Caladium ‘Lucky Purple’ is popularly grown for its vibrant and captivating foliage. 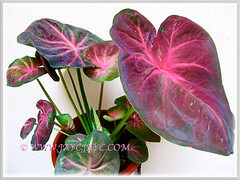 Botanical Name: Caladium ‘Lucky Purple’. 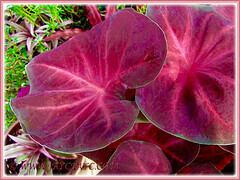 Common Names: Moung Mong Kol, Lucky Purple Caladium, Lucky Purple Elephant Ear, Heart of Jesus ‘Lucky Purple’. 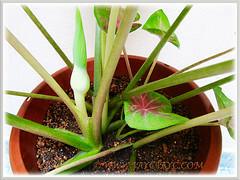 Etymology: The genus name, Caladium is coined for taro (edible starchy corms) on the basis of the Malay word, keladi. The cultivar epithet, Lucky Purple may refer to its beautiful hues of purple-coloured leaf blades. 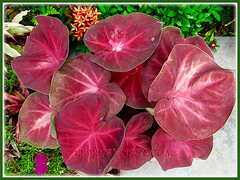 Origin: Caladium ‘Lucky Purple is a stunning cultivar that was hybridised and grown from tissue cultures in Thailand. Features: Caladium ‘Lucky Purple’ is from the genus Caladium that consists of approximately 7 species of flowering plants and over 1000 named cultivars and hybrids of Caladium bicolor from the original South American plant. Caladium ‘Lucky Purple’ is a fast-growing tropical perennial with an upright-growing habit that can reach between 20-30 cm in height and spread as wide. This stunning caladium is fast gaining popularity worldwide as it can be grown as a houseplant or outdoors. 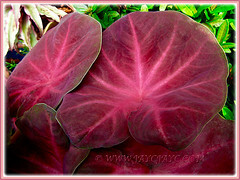 Caladium ‘Lucky Purple’ produces medium to large rounded heart-shaped leaves. They have pinkish purple colouration and beautiful bright pink venation. Some of the leaf blades have various hues of green on them. Each leaf will be borne on a long petiole that emerges from the underground tuber. The petioles are attached to the centre of leaves, a condition called peltate. 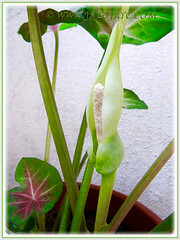 Similar to plants in the Araceae (Arum) family, the plant will produce an inconspicuous inflorescence with a white spathe covering the spadix that bears the tiny flowers. Female flowers are grouped at the lower part whereas the male flowers are at the top. They will be followed by inedible white berries when ripen. 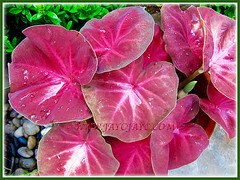 Culture (Care): Caladium ‘Lucky Purple’, also known as Moung Mong Kol grows easily with least maintenance. Light: It prefers semi-shade though best with morning sun or bright light. Avoid direct sunlight that can scorch its foliage. It loves hot, warm and humid conditions. 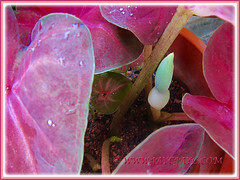 The ‘Lucky Purple’ is one of the newer sun-tolerant caladiums. Moisture: Moderate water requirement. Water regularly as it needs constantly moist soils. Soil: Grow in humus-enriched, sandy/loamy, moisture-retentive and well-drained soil. Others: Remove withered or sunburnt leaves to keep the plants tidy and aesthetically pleasing. Feed once monthly and lightly with a balanced liquid fertiliser for optimum plant growth. The leaves turn darker and more vibrant when fertilised and located in an area with morning sun or bright light. No known serious pests or diseases. However, do watch out for slugs and snails that may chew holes in the leaves. It is resistant to deer and rabbit. Take note that contact with all parts of caladium may irritate sensitive skin and ingestion can cause swelling of the mouth and throat. Also, toxic to cats and dogs. For subtropical and temperate regions: Hardiness: USDA Zone 10-11. An eye-catchy perennial in hardy regions. Tubers can be dug and stored indoors in colder climes. When the ground temperature has warmed up and frost is over in spring, you can plant them in the ground or into a pot outdoors. The hotter the air and ground temperature, the faster their growth. In non-hardy regions, they are grown as houseplants and best to be grown in pots so that you can overwinter indoors and bring them outdoors once the weather is warm. Withhold feeding and water sparingly during the winter dormant period. Provide bright light, warmth and humidity if grown indoors as a houseplant. Propagation: By division of the tubers or offsets to get new plants. 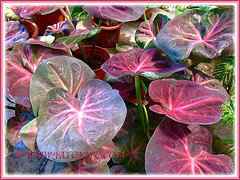 Usage: Caladium ‘Lucky Purple’ or Lucky Purple Elephant Ear, popularly grown for its stunning variegated foliage will make an excellent ornamental specimen in any garden. A vibrant plant that’s most ideal to be grown in a border around trees, especially when massed with other colourful caladium to further enhance the scenery. Perfect too for container gardening in pots and raised planters. Great as an eye-catchy houseplant for indoor decor, especially in non-tropical climes or located at patio and deck, outdoors.